Forced expulsions, violent recriminations, mass exodus, peaceful co-existence - just some of the possible outcomes for hundreds of thousands of Southern Sudanese living in the North, and to a lesser extent, vice versa, after a January referendum when the South is likely to vote to transform its semi-autonomy into full independence. “We are worried for the future, of what happens after the referendum,” said James Jok, a vegetable seller who has lived in the Northern capital Khartoum since fleeing violence in the Southern state of Jonglei over two decades ago. Sudan’s information minister Kamal Obeid fuelled such fears on 25 September when he said Southerners in the North would not enjoy citizenship rights if secession was the outcome of the referendum. "They will not enjoy citizenship rights, jobs or benefits, they will not be allowed to buy or sell in Khartoum market and they will not treated in hospitals," Obeid said in statements carried by public radio. "We will not even give them a needle in the hospital,” he said. The 9 January referendum is the climax of the 2005 Comprehensive Peace Agreement (CPA) that ended Sudan’s 22-year-long civil war between North and South over governance, resources, religion and ethnicity. An estimated two million people died and four million were forced to flee their homes. Tensions remain high between the former enemies, however, and slow progress on the referendum process, including negotiations over reciprocal citizenship rights, has generated frustration and suspicion on both sides. In the South, the mood on the streets appears overwhelmingly pro-secession. On 8 September, US Secretary of State Hillary Clinton said a Southern vote to split was “inevitable”. The complexities of identity in Sudan, where many people belong to several ethnic, religious and linguistic groups, often blur the distinction between Northerner and Southerner. Many of those classified as “Southerners” in the North have spent all their lives in Khartoum after their families fled the war. “If the South separates, Southerners in the North and Northerners in the South will be especially vulnerable to violence and loss of citizenship, resulting in statelessness,” the Washington-based advocacy group Refugees International stated in a June report. Violence, in either region, could spark retaliation on the streets of the opposing capital, it added. The report went on to cite fears of “large-scale revenge killing of Southerners in the North if even a single Northerner were harmed in the South”. To encourage Southerners to return home, the humanitarian ministry in Juba has released plans for a US$10m "emergency repatriation programme", launched under the slogan "Come Home to Choose". Some aid workers are sceptical about the plan, noting that there is little time left to implement the proposal. Besides, the South's already struggling resources would be swamped if thousands of people arrived each day. Returns have so far been affected by localized armed conflicts, lack of services, land disputes, and weak government capacity. "IDPs and refugees who returned to their places of origin after the CPA often found their houses and plots occupied by individuals or [government] staff," the Norwegian Refugee Council said in August. "The process of restituting land and property rights is slow and has sometimes led to violence between returnees and occupants who are often IDPs themselves," it added. 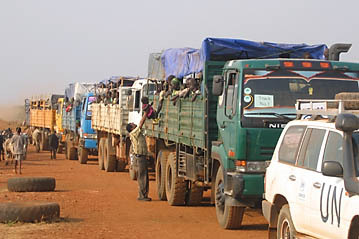 In August 2010, Southern Sudan’s humanitarian minister, James Kok Ruea, urged aid agencies to plan for a massive displacement of Southerners after the referendum. "People will be coming, and we will not be prepared." Protection agencies are working to ensure the returns are voluntary. "In the context of the referendum, the UN and the humanitarian community at large are keen that procedures for voter registration, notably in the North and overseas, be finalized, widely disseminated and accessible," Mireille Girard, UN Refugee Agency (UNHCR) deputy representative for Southern Sudan, told IRIN. SUDAN: Siham Moussa Abdelatti, "I am a mix of North and South"
Vote will "increase humanitarian needs"
"This constitutes an important criterion for decision about return, for both IDPs in the North and for refugees,” she said. "Related to the referendum is the issue of citizenship and residency rights which are still under discussion between the CPA parties," Girard added. "It is important that such information be made available to concerned populations, including Northerners in the South, as soon as possible. This will be critical in people's decisions about return." The referendum presents Sudan with more nuanced options than merely unity versus partition. In the event of secession, it is not yet clear whether the border will be a “hard” one between two fully separate states, with restricted movement and visa requirements, or “soft” with free movement guaranteed for people and goods, and guaranteed residency rights. “Too firm a barrier would threaten pastoralist livelihoods in North and South alike, create hardships for Southerners who rely on goods and services from the North and unnecessarily restrict communities which see the benefit of joint cross-border initiatives and interaction,” the International Crisis Group stated in a recent report. Numerous thorny issues will have to be negotiated, the report says, including, “who can cross the border; their legal status; how they are to be identified; where, when and for how long they can cross; and the rights and responsibilities of individuals on both sides of the boundary (including economic activity, grazing fees, social arrangements and taxation)”. But he added that the North depends on Southern labour in many areas and so was “unlikely to expel Southerners en masse”. In the South, Northerners also worry about the consequences. “I fear that if there are problems in the North, if they force Southerners out from Khartoum, then we will be in a bad situation here in the South,” said Ali Said, a trader in the Southern capital Juba. Born and brought up in Juba, his family roots lie in the Northern state of El-Gezira. “I wish to stay in the South, but I am frightened that any violence there [in the North] would be copied here in Juba,” he added. *This report has been updated to include remarks by information minister Kamal Obeid.